As we all known, getting a flat or an overinflated tire on the road can be very dangerous. It is necessary to check on your car's pressure to prevents tire blowout, ensures your safety. Here digital tire inflator with pressure gauge can perfectly meet your need! Can be used to inflate/deflate for tire, measure the tire pressure. Built-in bleed button to adjust the air pressure when the tire pressure is too high. No need going to Gas station check it, now you can do all in one shot. Add To Cart Now - Adjust Your Car Tire Pressure Anywhere Or Anytime To Guard Safe Driving! 1. You need an air compressor (NOT included) if you need to inflate tires. 1. Measure tire pressure when the vehicle is cool. 3. Please take the batteries out if long time none-use. 4. Don't take gauges apart, or it will leads to air leakage, wrong display or unfixed damage to the gauge. ★WIDE USE AND BATTERY SAVING - Widely applied to car, suv, truck, motorcycle, bike, ball, etc. 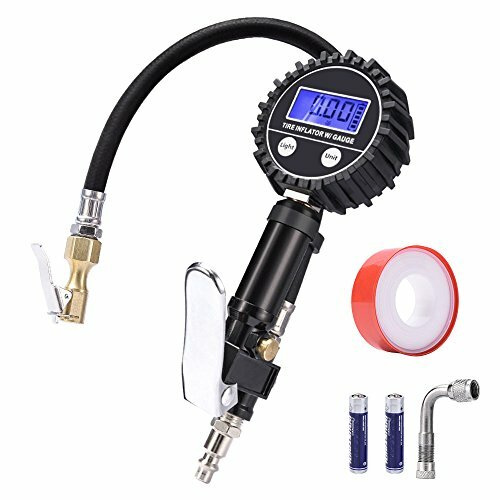 WHTA YOU'LL GET: 1x Digital Tire Pressure Gauge, 1x 90 Degree Valve Extender, 1x PTFE Thread Seal Tape, 2x AAA 1.5V batteries plus 2 Year Warranty and lifetime customer service. If you have any questions about this product by MICTUNING, contact us by completing and submitting the form below. If you are looking for a specif part number, please include it with your message.